Yes, the Twins finally made an off season acquisition. 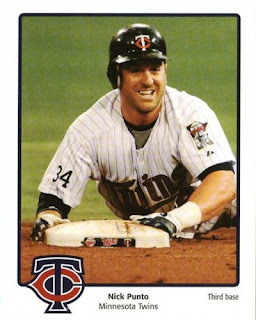 As Twins fans, we can now all calm down knowing that Nick "i lick sweaty balls" Punto will be back for two more years with the Twins. It is sure that his .207 batting average is going to help the team out. This guy has the same amount of offensive skills as skippy does on the work bench. Watching Punto play ball is like watching a young Matt Murphy, in net for the VFW Bantam team. Punto's smile in this picture also brings me back to the days of a happy go lucky Bucky H! Let's go Twins.